…today announced that it is the #1 social network in Singapore, and almost twice the size of any other social network in the country. Friendster is almost 2 times bigger than Facebook and more than 7 1/2 times bigger than MySpace in Singapore — according to the third party, well-known Internet measurement company, comScore. 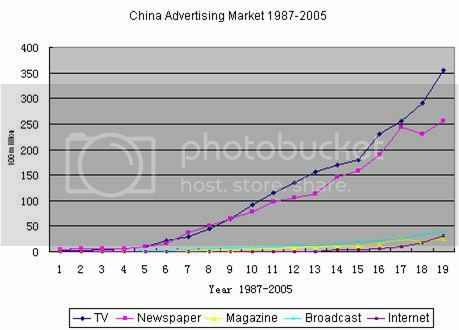 According to the statistic data from State Administration for Industry and Commerce, the total volume of China advertising market in 2005 was RMB 141.63 billion, 12% higher than RMB 126.46 billion in 2004. 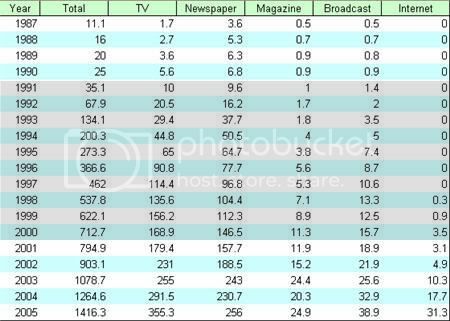 We can see the advertising spending on TV and newspaper in China is still far ahead of the other media types. However, Internet is growing dramatically to catch up. Finding a way to measure the efficiency of different channels is important. Internet aren’t necessarily always taken as being competing with TV and newspaper. It can also be taken as a tool to measure and track the TV and newspaper campaigns.